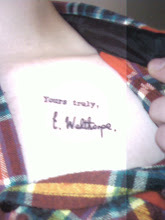 Yours Truly, Edna Welthorpe: This is the reason for dreaming. So, it has finally come to this. I can't say that I'm surprised. I enter the blogosphere with total awareness that I am a hypocrite. Despite what I may have said about the whole practice in the past, here I am...going for it. Go ahead, judge me. I dare you. Henceforth, this will be a dumping ground for my (obviously enthralling) accounts of and thoughts about theatre and performance. Again, I dare you to judge me. I can't think of a better way to spare my friends the pain of listening to me gush about my love of all things dramatic. I meant that to come from me, najy. wrong email.